Welcome to my website. I do research, teach and write in the Social Sciences. Over the last fifteen years I have done field research in Kosovo; Romania; Italy; the UK, France and Germany. Since July 2018, I work as a Lecturer (Tenured Assistant Professor) in Sociology at Glasgow University, UK. 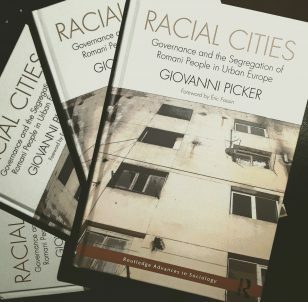 After nearly a decade of ethnographic and historical research, in 2017 I published Racial Cities: Governance and the Segregation of Romani People in Urban Europe, a monograph which merges Race Critical Theories and Urban Studies from a global and historical perspective, to explain key aspects of the racial segregation of Romani people in contemporary Europe. I have taught undergraduate and graduate courses in Sociology, Cultural Studies and Social Anthropology in Italy, Russia, Germany and the UK; I have supervised BA and MA students on subjects ranging from the Anthropology of the State to Everyday Racism, and given public talks in Hungary, Japan and Germany. I am active in international research and education projects, including the Summer School on Black Europe that takes place every year at IIRE (Amsterdam, The Netherlands). I value collaborative actions and projects with artists, journalists, activists and researchers - for collaborations or for any query, please get in touch. My broad research interests lie at the intersections of urban life, race and the state. Apart from this core research area, I am also interested in the histories of the Left; ethnographic thinking and practice; Socialism and Postsocialism, and the historical sociology and anthropology of colonialism. I just finalized my Marie Sklodowska-Curie research project (2016-2018), entitled “Camp-bivalence”, which continued the conversation about urbanity, race and colonial modernity that I had started with Racial Cities; it ethnographically and historically explored the relationships between civil society and minorities over the last 30 years in four European cities - Rome, Berlin, Birmingham and Bucharest. The empirical focus was on specific urban locations that are directly related to one of the three historically “others” of Europe, i.e. Romanies (Rome and Birmingham), Black Africans (Berlin) and Muslims (Bucharest). The theoretical standpoint revolved around urban modernity and ambivalence (e.g. Arendt 1951; Bauman 1991; Goldberg 1993; Alsayyad and Roy 2005) and directly engaged with camps as quintessentially modern socio-spatial formations emerged out of colonialism. In doing so, my research aimed to develop a conversation about the varied and variable entanglements of race/racism, class, gender and ethnicity on one hand, and urban planning on the other, textured by the ambivalent notions of in/exclusion and integration, that to date have received relatively little attention. My research contributes to shaping scholarly, media and policy debates on cities and inequalities in Europe and beyond. Scholarly debates include (a) Urban Studies conversations on the history and theory of planning, urban poverty, governance, displacement and stigma, and (b) Race and Ethnic Studies on relational racism, European "colonial legacies”, social integration and in/exclusion in cities. 2017 Racial cities: Governance and the segregation of Romani people in urban Europe. Abingdon and New York: Routledge (Foreword by Éric Fassin). "Racial Cities, in its remarkable intersection of diverse strands of thought, demonstrates how the persistence of everyday colonialism roosts in Europe through the ordinary and proliferating segregations based on race continuously reinvented within the problematizing of Gypsy urban areas"
AbdouMaliq Simone, Research Professor, Max Planck Institute for the Study of Religious and Ethnic Diversity. "Racial Cities sounds a vital alarm over everyday and institutionalized racism and discrimination vis-à-vis Romani people, defined at once as a scourge and threat, in a race-blind Europe. Not only does Giovanni Picker draw needed light to the "organizing logic" and specificity of race, biologized as culture, in neoliberal states from the East to the West, he also illuminates how Romani segregation is a conspicuous lived-reality—hidden in plain sight—that indexes a naturalized and under-analyzed anti-Romism, and thereby a distinct yet familiar race question in Europe". Trica Keaton, Associate Professor, Dartmouth College, and author of Muslim Girls and the Other France. 2018 Racialized Labour in Romania: Spaces of Marginality at the Periphery of Global Capitalism. Basingstoke: Palgrave. Co-edited with Enikő Vincze, Norbert Petrovici, and Cristina Raţ. "This book will be a key text in the emerging, powerful field of critical studies in race and class in post-state-socialist Europe". József Böröcz, Professor of Sociology, Rutgers, The State University of New Jersey, USA. This book critically examines the making and persistence of impoverished areas at the margins of Romanian cities since the late 1980s. Through their historical outlook on political economy and social policy, combined with media and discourse analysis, the eight essays of Racialized Labour in Romania forge new and cutting-edge perspectives on how social class formation, spatial marginalization and racialization intersect. The empirical focus on cities and the labour and the plight of the Roma in Central and Eastern Europe provides a vantage point for establishing connections between urban and global peripheries, and for reimagining the global order from its margins. The book will appeal to scholars, students, journalists and policy makers interested in Labour; Race and Ethnicity; Cities; Poverty; Social Policy; Political Economy and European Studies..
2019 Racial Urbanities: Towards a Global Cartography Social Identities: Journal for the Study of Race, Nation and Culture, 25(1). Special Issue, co-edited with Karim Murji and Manuela Boatcă. 2017 Confined Informality: Global Margins, Statecraft and Urban Life International Sociology, 32(4). Special Issue, co-edited with Silvia Pasquetti. 2015 Durable Camps: The State, the Urban, the Everyday CITY: Analysis of Urban Trends, Culture, Theory, Policy, Action, 19(5). Special Issue, co-edited with Silvia Pasquetti. 2019 Sovereignty beyond the State: Exception and Informality in a Western European City. International Journal of Urban and Regional Research, Online First. 2019 [Editorial] Racial Urbanities: Towards a Global Cartography. Social Identities: Journal for the Study of Race, Nation and Culture 25(1): 1-10. With Karim Murji and Manuela Boatcă. 2017 [Editorial] Urban informality and confinement: Toward a relational framework. International Sociology (OnlineFirst). With Silvia Pasquetti. 2017 Rethinking Ethnographic Comparison: Two Cities, Five Years, One Ethnographer. Journal of Contemporary Ethnography. 46(3): 2, 63-284. 2016 ‘That neighbourhood is an ethnic bomb!” The emergence of an urban governance apparatus in Western Europe. European Urban and Regional Studies, 23(2): 136 –148. 2015 [Editorial] Durable Camps: The State, the Urban, the Everyday. CITY: Analysis of Urban Trends, Culture, Theory, Policy, Action, 19(5): 681-88. With Silvia Pasquetti. 2015 Colonial Refractions: The “Gypsy Camp” as a Spatio-Racial Political Technology, CITY: Analysis of Urban Trends, Culture, Theory, Policy, Action, 19(5): 741-752. With David Smith and Margaret Greenfields. 2014 Abnormalising minorities. The state and expert knowledge addressing the Roma in Italy, Identities: Global Studies in Culture and Power, 21(2): 185-201. With Gabriele Roccheggiani. 2013 "Țiganu-i țigan": Verbal Icons and Urban Marginality in a Post-socialist European City, Civilisations. Revue internationale d’anthropologie e de sciences humaines, 62(1): 51-70, 2013. 2013. Sedentarisation and 'the right to nomadism': The urban and regional fabric of nomad camps in Italy (1967-1995), Zeitgeshichte. Journal of Contemporary History, 40(5): 276-286. 2011 'Welcome 'in'. Left-wing Tuscany and Romani migrants' (1988-2007), Journal of Modern Italian Studies, 16(5): 607-620. 2006 Fieldwork between Distance and Intimacy: Reflections on a Photo Exhibition on the Streets, ACHAB. Rivista di Antropologia, 6, 33-42. 2005 Le due rive di Mitrovica. Il ponte sul fiume Ibar/Ibër come frontiera interna. Conflitti Globali, (2):119-129. 2018 Conclusion: (Re)centring Labour, Class and Race. 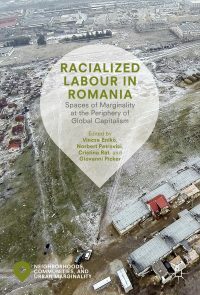 In Vincze, E., Petrovici, N., Rat, C. and Picker, G. (eds) Racialized Labour in Romania: Spaces of Marginality at the Periphery of Global Capitalism. Basingstoke: Palgrave, 107-226. 2017 Post-Socialist Europe and its 'Constitutive Outside': Ethnographic Resemblances for a Comparative Research Agenda. In Krase, J. and Uherek, Z. (eds) Diversity and Local Contexts: Urban Space, Borders and Migration. Basingstoke: Palgrave, 39-53. 2013 Policy Logic and the Spatial Segregation of Roma in Europe: The Case of Florence (Italy) and Cluj-Napoca (Romania). In Zincone, G. and Ponzo, I. (eds) How European Cities Craft Immigrant Integration: Something to Learn. 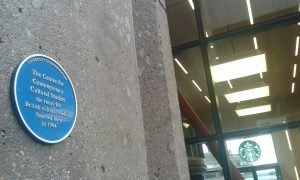 Brussels: Foundation for European Progressive Studies, 40-57. 2012 Left-Wing Progress? Neo-nationalism and the Case of Romany Migrants in Italy. In Stewart, M. (ed) The Gypsy ‘Menace’. Populism and the New anti-Gypsy Politics. London: Hurst & Co., 81-94. 2010 Nomads’ Land? Political cultures and nationalist stances vis-à-vis Roma in Italy. In Stewart, M. and Rövid, M. (eds) Multidisciplinary Approaches to Romany Studies. Budapest: Central European University Press, 211-227. 2011 Inclusione, esclusione, enclusione. Per un'etnografia della governance di rom migranti in Italia. In Zago, M. e Baldini, S. (a cura di) Il mosaico rom. Specificità culturali e governance multilivello. Milano: Franco Angeli, 77-87. 2006 Italian translation of Appadurai, A., "The Civilization of Clashes", in Sicuri da morire: La violenza nell'epoca della globalizzazione. Roma: Meltemi. Graff, Kristina and Noa Ha (eds) 2015. Street Vending in the Neoliberal City: A Global Perspective on the Practices and Policies of a Marginalized Economy . New York and Oxford: Berghahn Books.Urbanities, 8(1): 80-81, 2018. Lloyd, Christopher D. Shuttleworth, Ian G. and David W. Wong (eds), 2015. Social-spatial segregation: Concepts, processes and outcomes . Bristol: Policy Press. Urban Research and Practice, 9(2): 226-28, 2016. Sassen, Saskia. 2014. Expulsion: Brutality and Complexity in the Global Economy. Cambridge (MA): Harvard University Press. Urban Studies. 59(2): 1742-1745, 2015. Smith, David and Margaret Greenfields. 2013. Gypsies and Travellers in housing: The decline of nomadism'. Bristol: Policy Press. Roma Rights (1): 113-14, 2014. Palidda, Salvatore (ed). 2010. Racial Criminalization of Migrants in the 21st Century, Farnham and Burlington: Ashgate. Critical Sociology, 38(2): 333-338, 2012. Shore, Cris, Wright, Susan and Davide Però (eds). 2011.Policy Worlds: Anthropology and the Analysis of Contemporary Power, New York and Oxford: Berghahn Books. Ethnic and Racial Studies, 35(4): 780-781, 2011. Bravi, Luca. 2009. Between Inclusion and Exclusion: A Social History of Roma and Sinti Education in Italy [Italian]. Milan: Unicopli Press. Journal of Modern Italian Studies, 16(5): 735-737, 2011. Joint review: Vitale, Tommaso (ed) 2009. Possible Policies: Living in Cities with Roma and Sinti [Italian]. Rome: Carocci. And Cerchi, Roberto and Loy, Gianni(eds) 2009. Roma and Sinti in Italy: Between Stereotypes and Denied Rights [Italian]. Rome: Ediesse. Modern Italy, 16(3): 398-401, 2011. Sigona, Nando and Nidhi Trehan (eds) 2009. Romani Politics in Contemporary Europe: Poverty, Ethnic Mobilization and the Neoliberal Order, Basingstoke: Palgrave. Ethnic and Racial Studies, 33(9): 167-169, 2010. Però, Davide, 2007. Inclusionary Rhetoric/Exclusionary Practices: Left-wing Politics and Migrants in Italy, New York and Oxford: Berghahn Books. Anthropology in Action, 16(3): 69-70, 2009. ITALIAN TRANSLATION, Studi Emigrazione, XVII (3): 56-7, 2009. W. E. B. Du Bois and the Black US City. BA Sociology, University of Glasgow, UK, 2019. Empire and the Postcolony. BA Sociology, University of Birmingham, UK, 2018. Everyday Racism in Europe. Summer School “Rethinking the Culture of Tolerance”, University of Sarajevo, 2016. Europe and its “Minority Problem". Summer School “Rethinking the Culture of Tolerance”, University of Milan-Bicocca, 2015. Race, Colonialism, Italy: An Introduction. BA Sociology, Presidential Academy of National Economy and Public Administration, Moscow, 2014. European Colonialism: History and Legacies. BA Sociology, People’s Friendship University of Russia, Moscow, 2013. Three Cases of Citizenship and Ethnicity. Summer School in Romany Studies. Central European University, Budapest, 2009. The Social and Political Conditions of Roma in Italy. MA Politics, ELTE University and Corvinus University, Budapest, 2009. Romani Groupings in Yugoslavia. MA Social Anthropology, University of Milan-Bicocca, 2009. Ethnic ‘Unmixing’ in Kosovo: Anthropological Approaches. MA Social Anthropology, University of Milan-Bicocca, 2009. The European Dream. What Citizenship Regime(s) for Kosovo?. MA Social Anthropology, University of Milan-Bicocca, 2007. Looking at the History of Kosovo from an Anthropological Perspective. MA Social Anthropology, University of Milan-Bicocca, 2006.